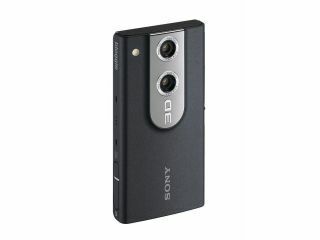 Sony has released three new Bloggie pocket camcorders at CES 2011 this week, including a 3D pocket cam. All of Sony's three new Bloggie HD video cameras pack in some new features, alongside the same high quality MP4 video recording, photo shooting and web sharing options from previous models. Sony's CES release informs us that the new Bloggie, Bloggie Duo and Bloggie 3D models will let you capture those "had to be there" moments "in full high definition 1920 x 1080 MP4 video and 5-megapixel still photos, but in a whole new way any time, any place with the introduction of 3D and dual screen capabilities". Melody Charlesworth, category marketing manager for Sony Bloggie says of the new range of affordable pocket cams: "As the popularity of pocket cameras grows, Sony can provide simple, compact video and photo solutions that are fun and easy to use. "With Sony paving the way in 3D entertainment, it's the perfect addition to the Bloggie family and offers an easy yet high quality 3D solution." The new range includes features such as a sensitive 'Exmor' CMOS sensor to achieve high resolution video and crisply-detailed still photos, an auto-adjusting GUI for vertical or horizontal shooting and viewing, autofocus, auto macro and a 'Share it Later' function to tag the clips and pictures you want to post online at a later date. Bloggie's also make use of Sony' SteadyShot image stabilisation for smoother footage, as well as Face Detection tech, which automatically corrects exposure. It's the Bloggie MHS-FS3 3D model that stands out from the crowd in the new range, featuring two lenses, two image sensors, a stereo microphone and a built-in LED light. The 3D content is also viewable without glasses on the camera's 2.4-inch LCD screen or with glasses on any 3D capable TV. The Sony Bloggie MHS-FS1 and MHS-FS2, both with 4GB of internal memory, will be available in March 2011. The MHS-FS3 with 8GB of internal memory will be available in April 2011.